If ever there was a photo in search of a caption contest, this is it. Caption suggestions in the comments, please. It's print day over at GrahamWatson.com again; there are a number of prints available from today's stage. In honor of his gigantic stage win today, I offer a candid snap of a much younger George Hincapie chatting up the crowd before the 1996 Olympic road race here in Atlanta. 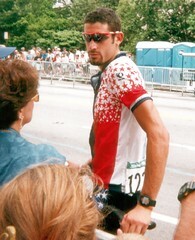 I'm working on getting a full gallery of photos from that race up, but in the meantime, here's Hincapie, just after his first Tour de France with Motorola. 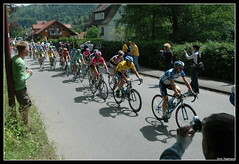 The 1996 Olympics were the first games where the road race and time trial were open to the professionals. 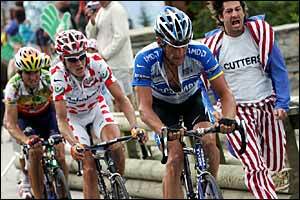 Hincapie rode with Lance Armstrong, Frankie Andreu, Greg Randolph, and Steve Hegg (just 5 riders per country, right?). As always, click through for a larger image, and to see some of my other cycling pictures, including shots from three stages of the 2005 Tour de Georgia, and a gallery of shots from the 1996 Olympic time trial. Josh from hyku points out that prints of any of these are available for order. ThePaceline.com offers one of Watson's shots, of Discovery Channel on the podium, in sizes fit for a desktop. One of the best perks of working for CNN.com was access to our AP Photo wire server. I think it was the last OS/2 box I ever touched, and even in 1999, it provided most of its photos at 6 megapixels plus. Some of my favorite desktop images to this day came off that box. You can get a taste of that with the Cycling Photo Wire at ESPN.com. The images are auto-posted as they move on the wire, so the turnaround time is much faster than the photo galleries at other sites. The shot above was taken during today's stage, and posted about 30 minutes after it was taken.